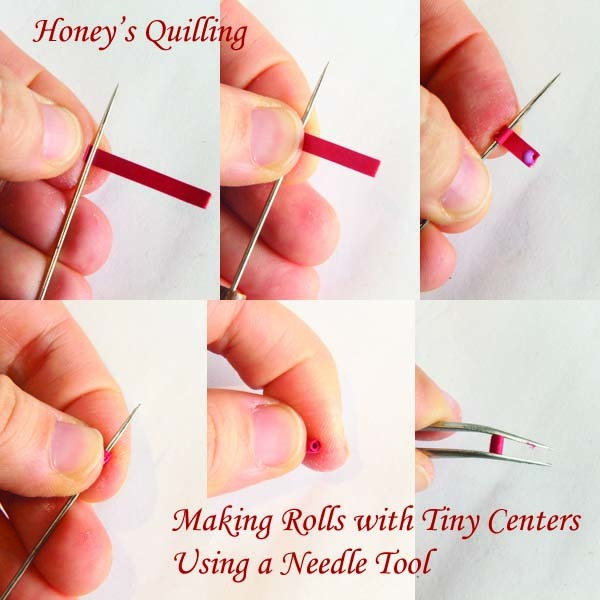 The first way is if you are using a regular slotted quilling tool. Normally if you are using a slotted tool, then you end up with a little piece of paper sticking in the middle of your roll. You can then use a needle tool or toothpick and stick it in there to smooth out the center like this picture below shows. But honestly I find that to be a bit of a pain. I don’t have time to do that for every tight roll I make! But if you don’t have the practice or tools for the next two options, you can resort to this option! The second way is to simply use a needle tool or other skinny object like a toothpick to wrap the paper around. This can take some practice to get a nice tight roll without something to grip the paper with. The nice thing about this method is that it gives a very tiny center if you use a needle tool. Sometimes I need a roll with a very tiny center, so I use this method for that. After rolling and gluing the tight roll I like to hold it in the tweezers and press to get it flat, as sometimes when you are rolling it can be a little uneven. The third way that I am sharing today is the method that I have not shared and is my secret to most of the tight rolls that I make. I don’t even remember when I first discovered this trick. My guess is it was sometime in high school or college when I was making designs that had more tight rolls and I wanted the smooth centers. So there are two keys to this secret. One is that you have to have the right tool. The tool I use for this trick is the first quilling tool that I ever got. Honestly I thought that I could only do this trick on this old tool, that it was unique and worn down just enough to do this trick. Luckily I found another tool that was very similar and I tried it, and it works! That’s one of the reasons I finally decided to share it! You can find this tool here or here on Amazon, and here at Custom Quilling. Looking for some more tips for making paper quilled jewelry? Check out the ones below that I have already posts, and check out all my general quilling tips here and free tutorials here. *All products and supplies mentioned in this post I purchased and/or made on my own. *This post contains some affiliate links. If you purchase products through the affiliate links I get a small percentage (at no extra cost to you!). I only link to products that I believe in and/or love to use myself. Thank you for supporting my blog! Hi Honey Thanks a lot for sharing your useful tips.